The first ever attraction that Vekoma ever produced was a portable Ferris Wheel in 1967. 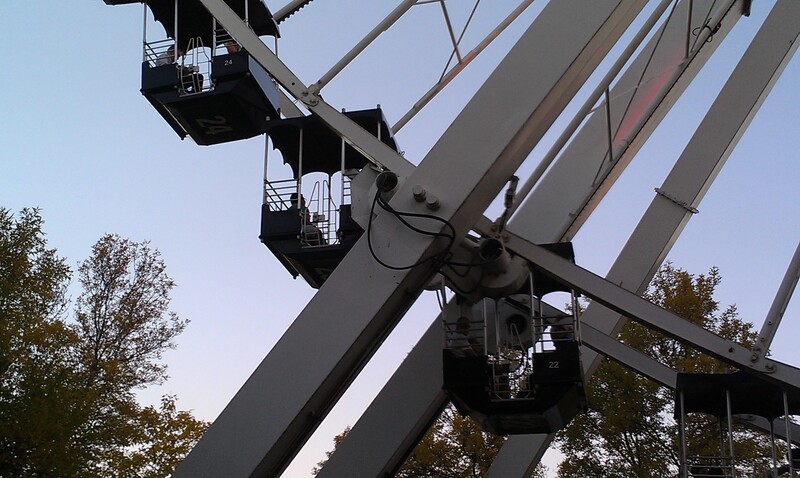 More Ferris Wheels followed, like for example at Walibi Wavre (Wavre, Belgium) when Tornado was not the only ride that Eddy Meeus bought from Vekoma. A large 165 feet tall ferris wheel was also installed toward the front of the park in 1979. 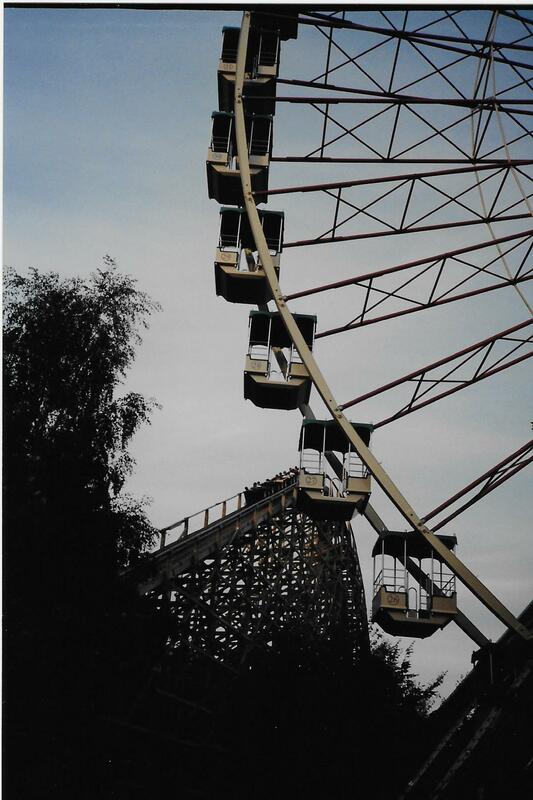 La Grande Roue photographed at Six Flags Belgium in 2001. That was the name Walibi Wavre was known as at the time. 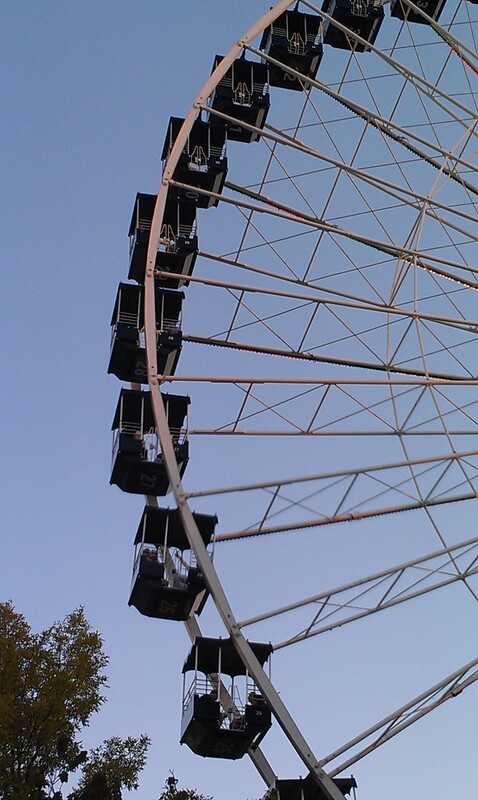 La Grande Roue was installed at La Ronde in 1984, alongside the Boomerang and the Astronef. It is 148 feet tall and has 40 cars. Each car can accomodate 6 passengers. One of the ride 8 footers. This one is one of the 4 side support ones. The ride use 4 motors connected to drive tires on each side to move the wheel around. Around 1979-1980, Vekoma built a number of “Super Loop” for the European market using a license from Larson International, inventor of the ride. This Vekoma Superloop returned to the Belgium fair circuit in 2011. 1981 saw Vekoma design their version of a classic attraction, the Paratower. It was a new take on the family parachute ride that was invented in the early 1900’s at Coney Island, NY. 6 gondolas are suspended to cables around a large 108 feet tower and the gondolas go up and down in a gentle motion. Interestingly, it was meant to be a portable ride, but it was not used for long on the German circuit. 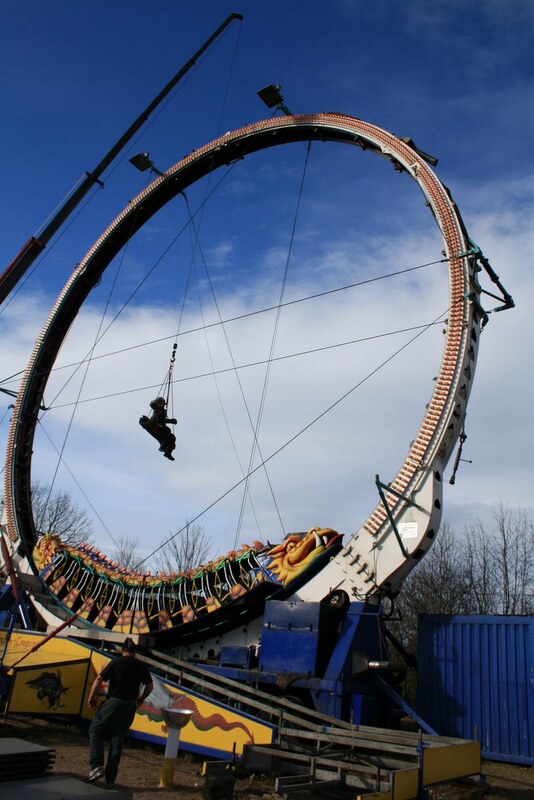 The first installation was eventually sold to Circus World, a now defunct amusement park in Haines City, FL and a further model opened that year as the Big Yoyo at Walibi Wavre. 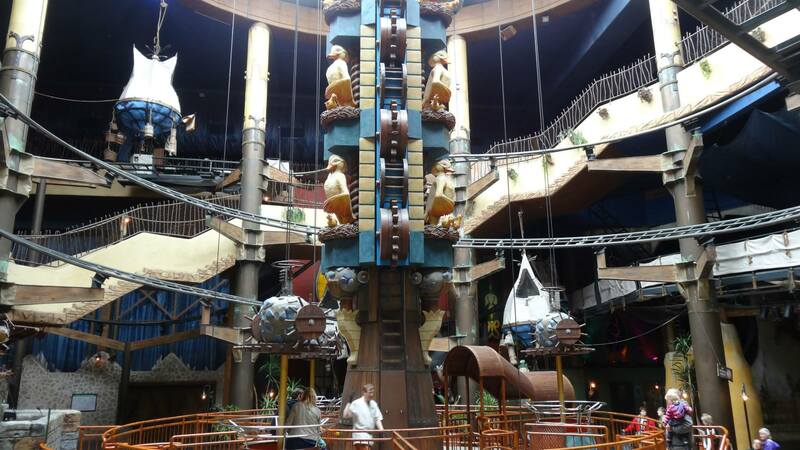 The last surviving model was sold as a Mini Paratower in 2001 that was designed to be shorter in order to fit inside the indoor Wuze Town complex at Phantasialand (Bruhl, Germany). The gondolas can also spin around gently during the ride. The Mini Paratower in the middle of the Winjas spinning coaster in Wuze Town. 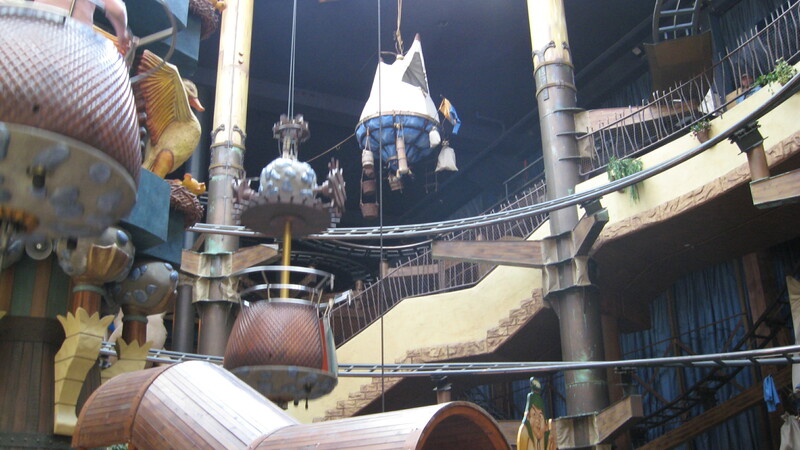 The ride was originally installed in 2001, but opened in 2002 along with the Winjas. Tittle-Tattle Tree, the Mini Paratower at Phantasialand. Picture appears courtesy of Flex. 1982 saw the introduction in the US of the Vekoma Ferris Wheel. 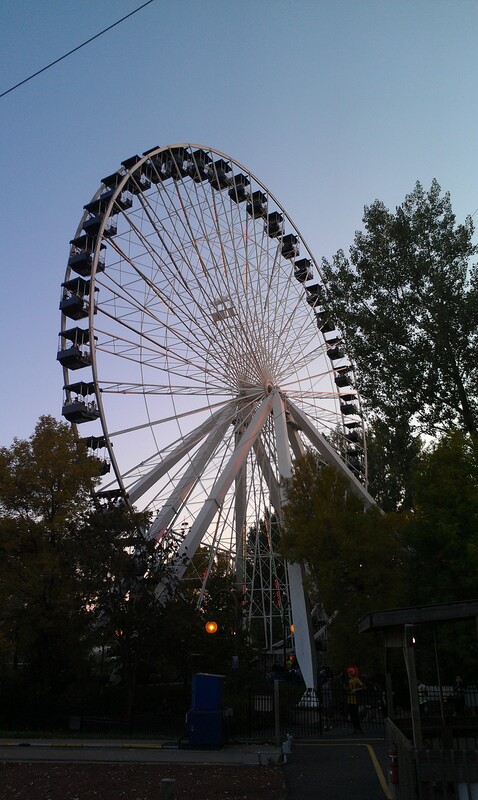 Standing 165 feet tall, it was originally the centerpiece of the 1982 Knoxville, TN World Fair. After the fair concluded, it was sold to Darien Lake (Darien Center, NY) where it still stands. A funny story that illustrates Vekoma great response time is that during shipping, 3 containers containing important parts of the Wheel were lost at sea. Vekoma re manufactured those parts and a 747 Freighter was chartered to get those parts to the Fair so the Wheel could open on time. 1983 saw Vekoma act as the partner for a fellow Dutch firm, Mondial Rides. 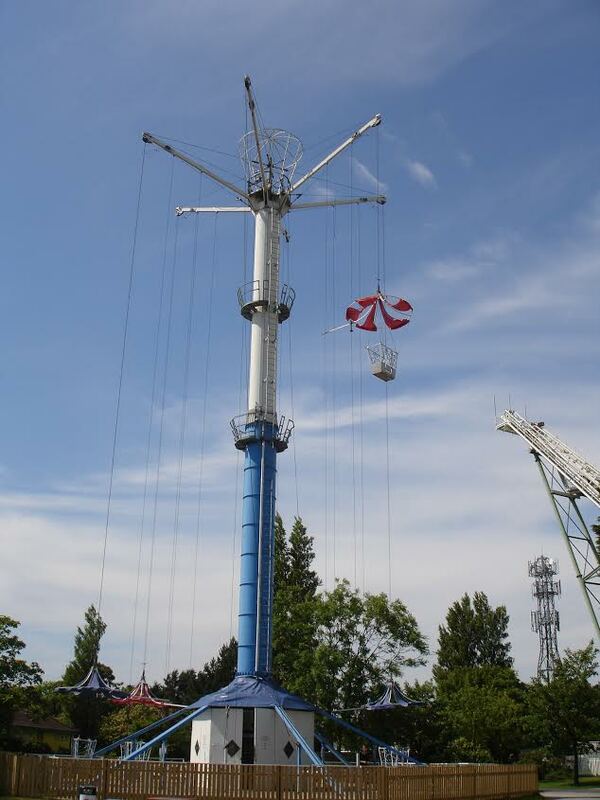 Together, they launched at the United Kingdom Goose Fair the “Skyflyer”. This modern take on the classic Eyerly Loop O Plane was designed to be easy to transport and used two futuristic cars that swung in opposite directions. 4 rows of 2 passengers were on each side of the cars and riders were restrained only by a ratchering lap bar for added thrills. Metal cages also came down on the rider’s area for further safety. The ride was very popular and many models were sold into the 1990’s to operators around the world. Due to age, most were removed today, leaving only the one at Flamingo Land (Malton, UK) in operation. The Astronef, a 1984 Skyflyer. Picture courtesy of Steve Lecours. 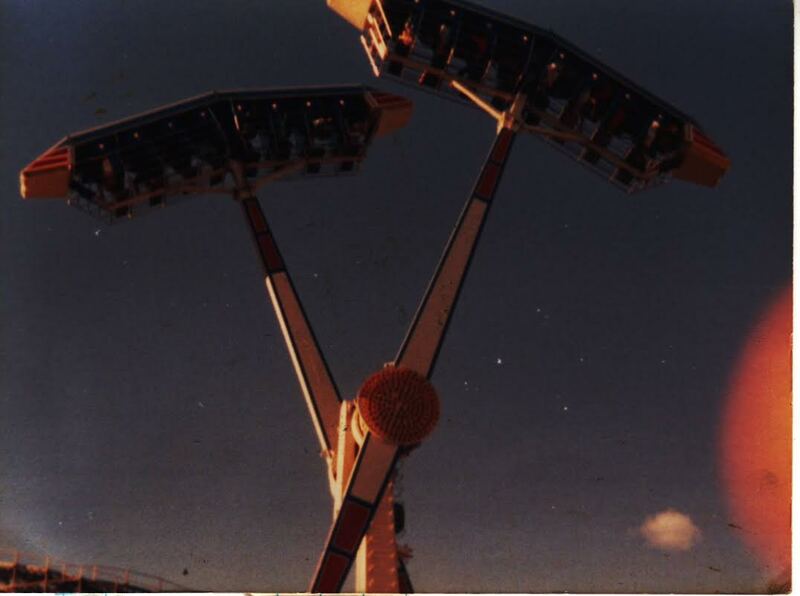 The Astronef at La Ronde in 2001. 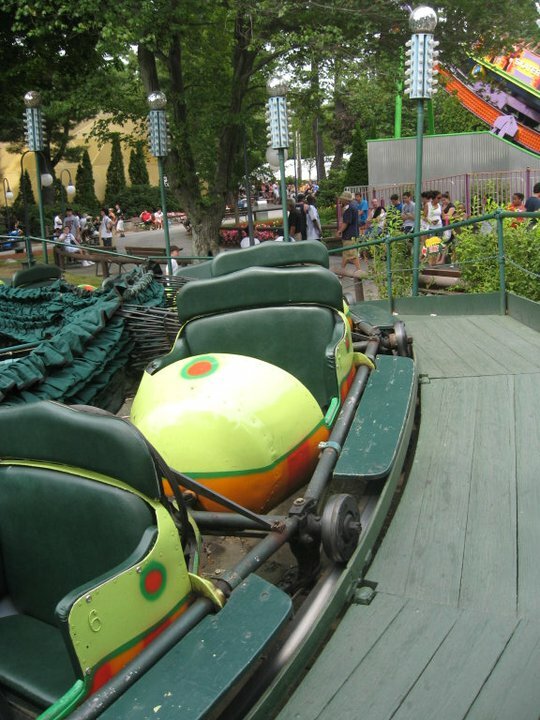 1984 saw the second collaboration with Efteling (Kaatscheuvel, Netherlands) when they manufactured the track and cars for a revived ride concept. In the early 1900’s, a popular kind of ride was the “Caterpillar”. Originally invented in 1925 by Hyla Maynes, it was manufactured by the most famous companies of the days, such as Traver Engineering and Allan Hershell. They paid Mr. Maynes a royalty for each installation and it became a “must have ride” at the ride for parks. One unique feature was the large canopy that would unfold and cover each car when the ride reached maximum speed. 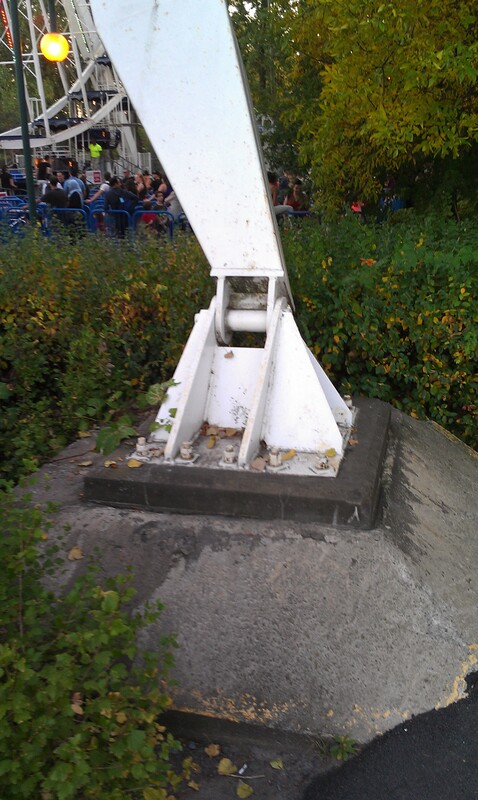 One last feature was a fan located at one point in the track that would surprise riders when they went over it. Unfortunately, as they aged, spare parts had to be manufactured either by the park themselves or local machine shops and parks started to remove them. Today, only the Caterpillar at Canobie Lake Park (Salem, NH) and Heritage Park Historical Village (Calgary, AB) still operate out of the originals. Two further models were built based on the original plans and one went to to the Great Yarmouth Pleasure Beach in the UK where it operates as Mulan today. The second one was the Caterpillar that used to operate at the Pavilion in Myrtle Beach, SC. After that park closed, a few rides were saved and now operate Broadway By the Sea, in the same city. Among them were the Caterpillar thankfully. The mecanism that lift the canopy over riders. The canopy when it is retracted. The canopy as it goes over riders. The canopy fully cover the riders at this point. So in 1984, after various companies had designed new versions, Efteling wanted to go back to the basics and get a modern version of the original Caterpillar. They designed the ride and got Vekoma to manufacture the track and cars to their specifications. Vekoma used for that the MK-1200 track, allowing roomy cars and eventually started selling it as part of their catalog under the model name “Regatta”. The ride currently operates as “Polka Marina” and is still a popular family attraction at the park. Polka Marina at Efteling. Picture appears courtesy of http://www.efteling.com/ . For 1986, in addition to finishing the Crazy Roller Coaster at Nanhu Amusement Park in Ghangzhou, China, Vekoma provided two water rides for that park. One of those was a large “Shoot The Chutes” style ride with a double down on the drop. The boats were smaller than the usual Shoot The Chutes though, with 4 rows of 4 per boat. The other attraction was a log flume. 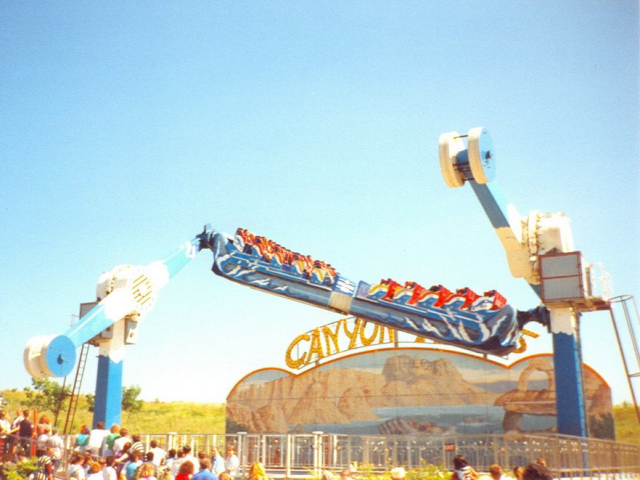 Around 1987-1988, Vekoma introduced a brand ride called the “Canyon Trip”. A large gondola with 5 rows of 4 seats that faced inward on each side was attached to two arms. 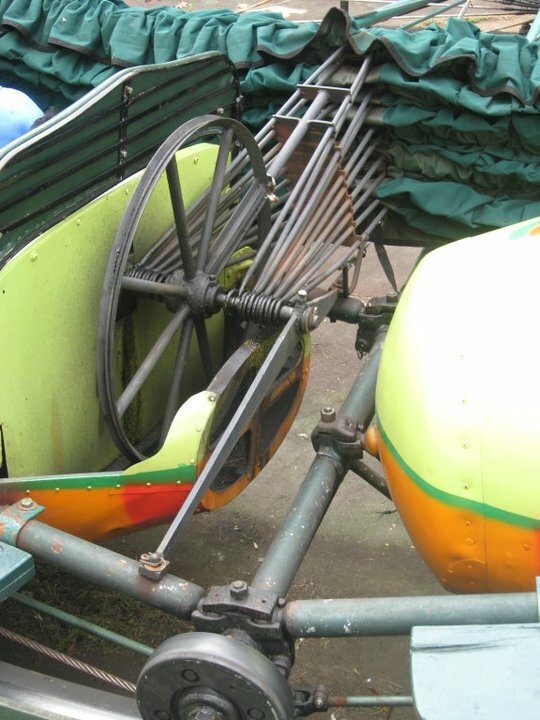 Both arms were straight and the unusual motion was allowed by having the cars slide on 3 steel columns, allowing the gondola to twist in strange and unique ways. The ride stood 47 feet tall when in operation and had quite a presence in the parks where it appeared. Contrary to popular belief, this was the first model of that style of ride, which lead to countless other models from other manufacturers and Vekoma themselves. From what I have been able to discover, at least 4 Canyon Trips were produced and sold to American Adventure Theme Park (Derbyshire, UK), Nagashima Spaland (Kuwana, Japan), Morey’s Pier (Wildwood, NJ) and Busch Garden’s Williamsburg (Williamsburg, VA) where it operated as the “Gladiator’s Gauntlet”. The last one to operate did so from 1994 to 2010 at Camelot Theme Park in Lancashire County, UK. 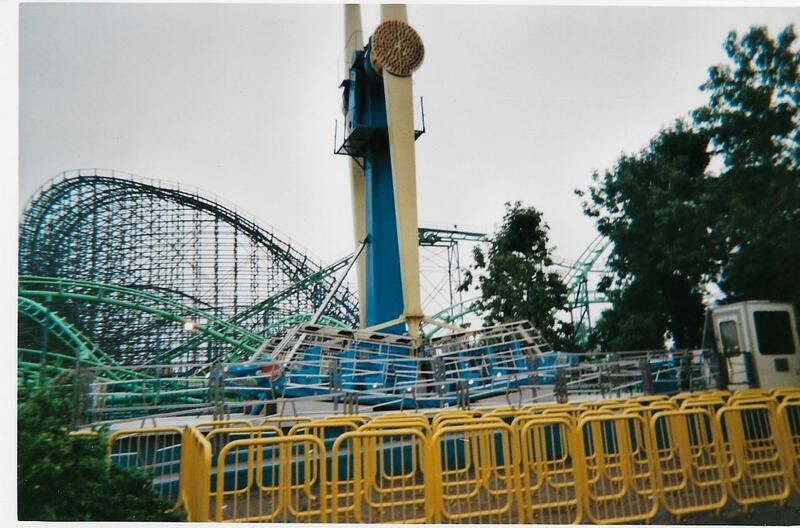 The Rack was the model that first debuted at American Adventure and it was removed due to a mechanical failure that was too costly for the park to fix. I was unable to track down where this particular installation operated. Based on the backdrop, it may have been a portable version in Europe. 1988 saw Vekoma building their third water ride, a new style River Rapids this time. 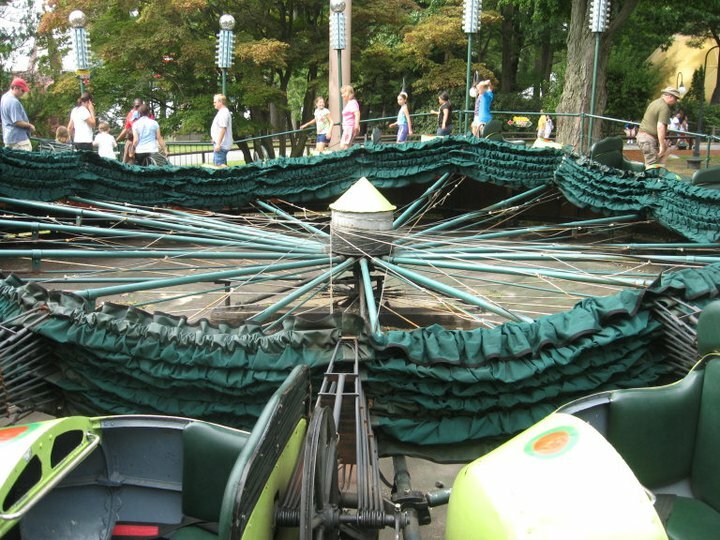 Built at Bellewaerde Park in Ypres, Belgium, Vekoma innovated by replacing the round boat mounted on a large floatation collar by a four segment boat. Each segment has space for two riders and has its own floatation collar and they are joined together. The end result of this is a very unique experience, since the smaller compartments amplify what would be harmless rapids on a traditional ride into an incredible experience. “Bengal River Rapids” features a 1480 feet long layout that takes its boats down a difference of 10 feet between the station and the lowest point of the ride. Various props and scenery are positioned around the ride. 3 water pumps are used to supply the ride with a 4500 liters a minute/1188 gallons a minute water flow to move the rafts along. Those 3 picture show the unique raft and passenger compartments. Those pictures appear courtesy of http://www.bellewaerde.be/en . In 1990, Vekoma delivered yet another ride to the Efteling. This was a unique purely human powered Cycle Monorail. Two riders sat in each cars and had to cycle their way around the circuit. Fun idea in theory, but what happens when you have either slower riders or just plain exhausted riders? 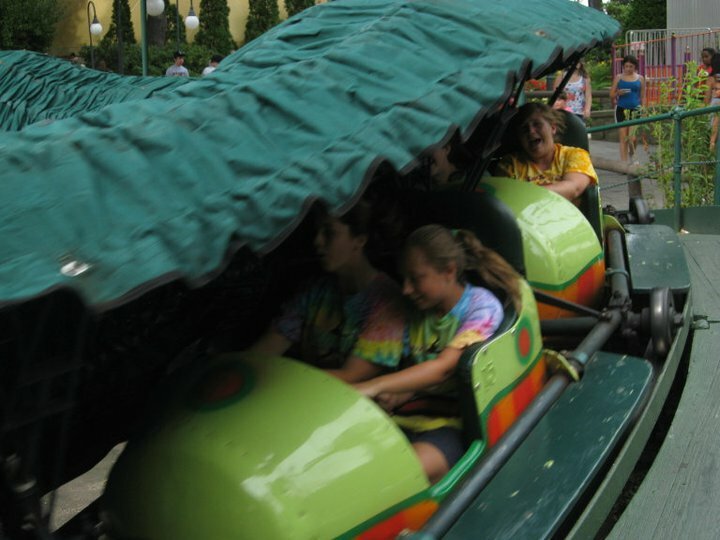 You had bottlenecks at various points around the ride and operators could not do much to help them. This unfortunately dropped capacity quite a lot. So in 1994, Vekoma hired an ex Vekoma director named Hans Gubbels to come in and fix the issue. The ride itself was fine, so what he did was install small motors in each car to power the cars around the ride even if riders are not as fast or just stop pedaling. 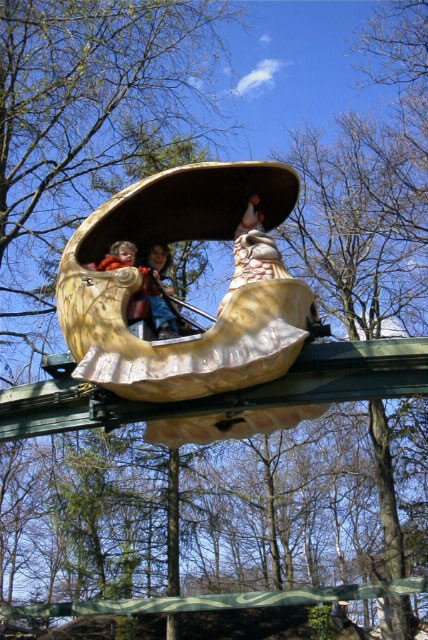 This picture show the snail cars on the Monorail at Efteling. Picture appears courtesy of fr.wikipedia.org . This entry was posted in Industry Profile and tagged Bellewaerde, Canobie Lake Park, Caterpillar Ride, Efteling, Formosan Aboriginal Cultural Village, Grande Roue, kentucky kingdom, La Ronde, Polka Marina, river rapids, Six Flags Mexico, skyflyer, Vekoma, waikiki wave, Walibi Wavre. Bookmark the permalink. ← Family Boomerangs and more Disney projects: part 8 of the Vekoma retrospective.